I powered it up with external adapter. It seemed to work fine - all drums sounds coule be heard - sequencer seemed to work OK. Noticed an intermittent issue with the LED display (right most character sometimes had a bar missing) - didn't seem to affect operation. SIEL MDP40 Very Rare 80s...for sale! 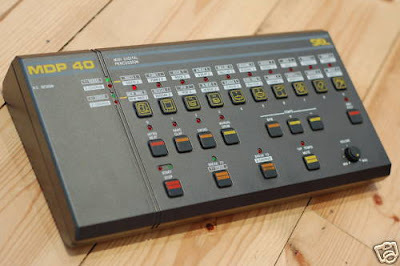 VerY Rare SIEL MDP 40 fully working in great condition runs off 6 aa batteries or 12v PSU included but a euro plug. 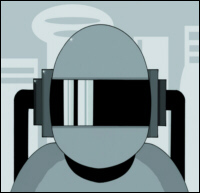 Has a number of cool presets and all drum sounds can be triggered via midi. This drum machine was release under a few different names Keytek and Suzuki here is a little write up i found. "I am a proud owner of this little monster of mediocracy, a Keytek MDP40 drum computer. I bought it used around 1990, without a box or manual. A Google search on "Keytek MDP40" returns no hits at all - I hope Hollow Sun can save it from oblivion! As I understand it, Keytek was the company in between when Siel folded and Roland took over the remains. MDP stands for 'MIDI Digital Percussion' and 40 is the number of pattern presets. 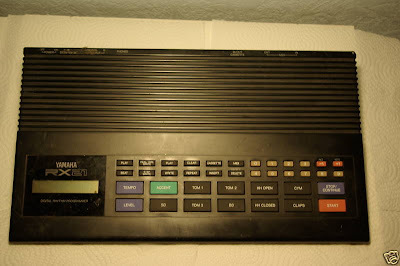 It was built in Italy around the mid 80s and features 12 different sounds which take up around 128Kb when sampled in 16bits. The sounds are bass drum, snare, rimshot, tom, closed & open hihat, cymbal, handclap, shaker & cowbell. It's not velocity sensitive but does have low-velocity versions (intended as brush or for variation?) of the bass, snare & closed hihat. 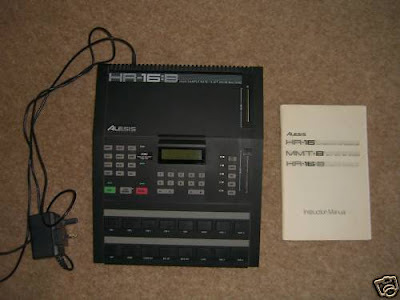 One could play drums manually on the device itself or by MIDI In. The latter is how I do it since the switches for base & snare drum have worn down. The lousy bouncing contacts result in 3 or 5 shots instead of one! Some will describe it sounding "cheezy" but others just can't get enough of that. 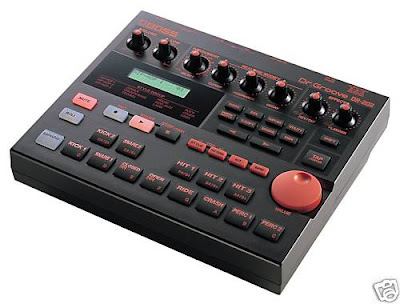 Fact is that with General MIDI songs I find it sounds better when drums are played by this device instead of any soundblaster wavetable. I still use the sounds of this this device in my own songs, routed through a diversity of effects of course (compressor, EQ, pitch, reverb, delay, etc.)." I am extremely grateful for this rare donation - it's not a Linn (that's for sure!) but it does have a certain lo-fi charm and appeal that could find a place in many genres of modern music. This is a little gem made all the more attractive because of its obscurity and it's unlikely that any other sample library features this rare little beatbox! CLICK HER TO BID ON THIS ITEM! MACHINE BOY'S new drum'machine'driven! PEOPLE EP reviewed at CityLifers! 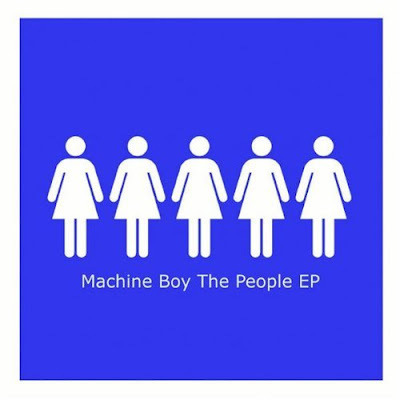 Those fine...fine PEOPLE at www.CityLifers.co.uk have done a spanking little review of Machine Boy's new release 'The People EP' (The Shotgun Charlie Label) the ep will be available worldwide thru all top download websites from 1st March 2010, as well as 3 mixes of People incl. 2 brand new Machine Boy (re)mixes the ep includes a couple of new tracks 'Backslider' & 'BlackRox', you can hear preview samples at AMAZON now! and you can view CityLifers very excellent review of PEOPLE HERE! CLICK HERE TO READ CITYLIFERS REVIEW OF THE PEOPLE EP! CLICK HERE TO HEAR A PREVIEW OF THE EP AT AMAZON! 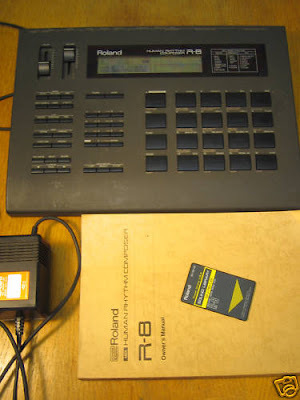 CLOSE UP look at the Roland TR909 prt1! 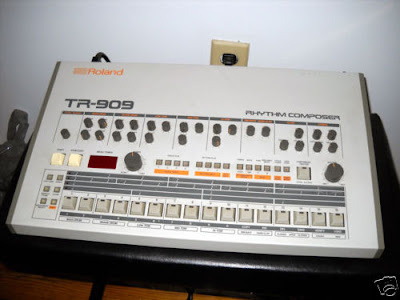 Here's part one of a close up look at the Roland TR-909. ORIGINALLY POSTED ON YOUTUBE BY PHONO1337! CLASSIC ROLAND TR77 Vintage...for sale! 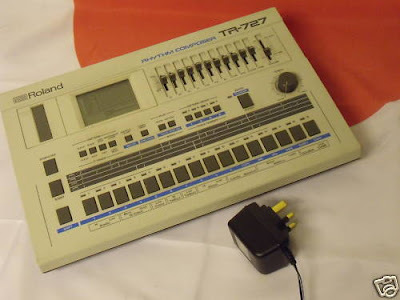 This listing is for a Roland TR-77 Rhythm 77 vintage drum machine. The unit is 100% functional and it is in nice cosmetic shape as well. Well maintained and lightly used in a smoke free home studio. 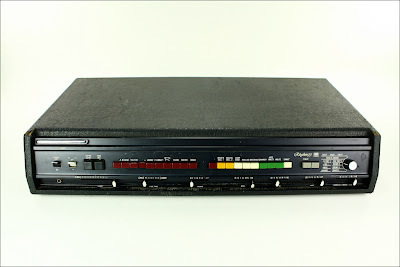 ULTRA RARE KORG UNIVOX MR-8...for sale! 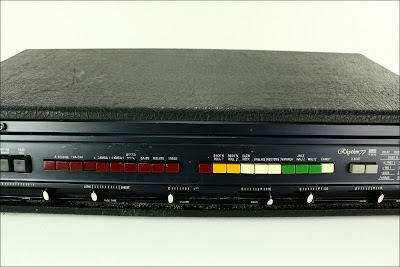 1971 Univox (Korg) Micro Rhythmer MR-8 analogue drum machine. Excellent condition, fully working - a real collectors piece. Here's something you don't see every day - a very nice condition 1971 vintage Univox MR-8 (Univox later became Korg). It is a preset analogue drum machine with 8 patterns and five sounds. It works great, looks great and sounds great! Perfect working order, but I haven't used it in so long that I can't justify it taking up space any more. Even comes with the original instruction manual! 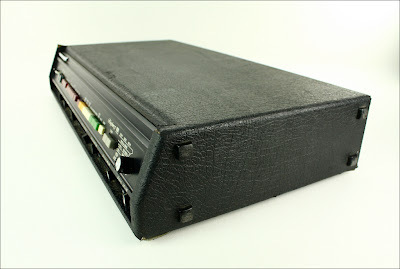 On SonicState.com this drum machine is rated 4.2/5 - "An incredible drum machine when released. 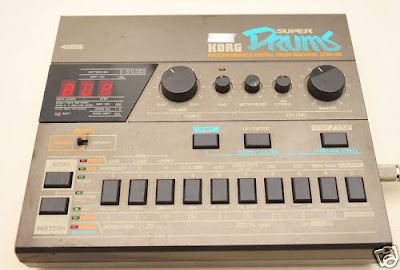 Still one of the easiest to use, if not the easiest"
One of the best drum machines ever produced, eclipsed only by its later sibling, the R8 mk11. 68 percussion sounds, sampled at 44.1kHz with a 16-bit dynamic range, giving superb sound quality. The 16 large, touch sensitive key pads allow you to alter volume and tone naturally by striking the pad with varying force. Pan, Decay and Pitch can be altered to allow you to create expressive rhythm performances. The Copy Instrument function allows you to create up to 26 edited instruments, in addition to the existing ones. The R-8 mk 11 can store 'feel patch' data. It also allows you to set the Timing Velocity / Decay / Pitch / Nuance for each note of a rhythm pattern, allowing you to create realistic performances. 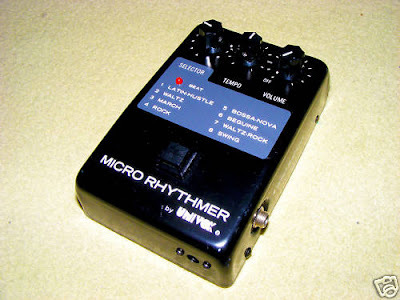 It can store up to 100 user-programmed rhythm patterns and up to 10 Songs. 8 individual outputs, as well as stereo and phones give very flexible mixing options. Midi In, Out and Thru. Tape Synch. Start/Stop footswitch jack. Expression Pedal jack. Slots for RAM and ROM cards. There's just too much to list for this machine. If you're looking, you'll know all about it. 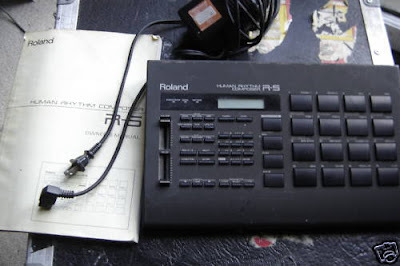 The original manual and power supply are included, as is a Power Drums USA SN-R8-09 ROM card. I don't have the original box, but it will be very well packed for shipping. It is in what I would call 'well loved' condition. It has obviously been used, has no real deep scratches, dents or serious damage to it, but does have a series of smudgey graze marks on it. A couple go very slightly below the surface finish of the machine, but most are not scratches as such, more like the kind of mark that a pencil rubber might make. I have tried to show them as best I can on the photos. 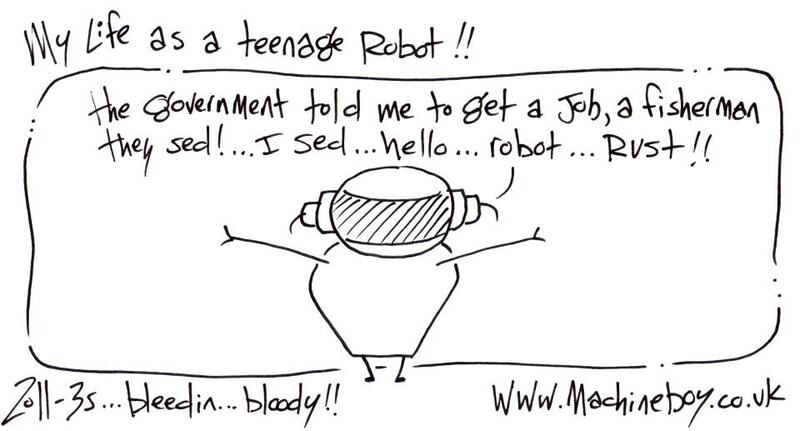 They make no difference at all to the working of the machine. It operates perfectly. Postage rate includes full insurance. Please ask for postage rates to specific non-UK addresses. 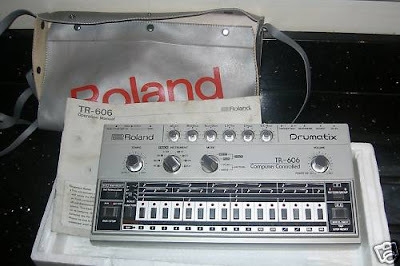 This is the famous Roland TR 909 Drum Machine. You're not likely to find one in this condition. Everything is 100% functional and was checked and tested by professionals. It runs like new, all knobs turn smooth like the day it was purchased. And it looks new as well. A few minor scratches on it you'd think it was purchased new last year! NB. This comes with a US power lead, so you would need to get it converted to UK voltage, or use it with a step down transformer. It comes with the Manual. From the days when enormous drum sounds walked the earth. ALL SEEMS TO BE WORKING ALTHOUGH I HAVE NOT USED IT FOR SOME TIME. THE OWNERS MANUAL IS ON A CD. 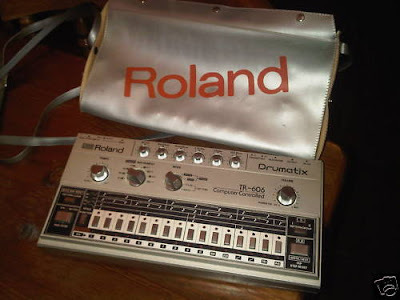 ROLAND TR606 Drumatix Vintage...for sale! Great great machine in perfect working order, supplied complete with dedicated case and shoulder strap. I really dont want to part with it but we all gotta get a grip and grow up a little. Very reluctant sale. All you need is a standard transformer that can deliver 9 volts and you're away! The machine is in very good condition with very few minor marks, no dents or scratches. 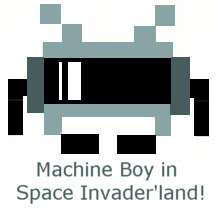 NEW Machine Boy video for People! The full ep will be available worldwide from all good download websites on 1st March 2010. CLICK HERE TO HEAR SAMPLES AT AMAZON! playing around with an EKO Rhythmaker - an old, analog Italian drumbox from the seventies. It has a volume fader for each sound (there are 7 sounds and 7 sliders) and a SUSTAIN knob for all sounds together. CLICK HERE FOR ORIGINAL YOUTUBE POST! A nice demonstration of Nintendo's Wii Drums! Great quality. CLICK HERE FOR ORIGINAL YOUTUBE PAGE! This vintage machine features 10 individual outputs (one for each timbre!!) in addition to L/R and headphone outputs making it an extremely versatile piece of kit, you have the ability to process each drum sound independently with FX very easily so is an extremely useful addition to any studio!! Each drum has its own level control for precise adjustment too! TO BID ON THIS ITEM CLICK HERE! 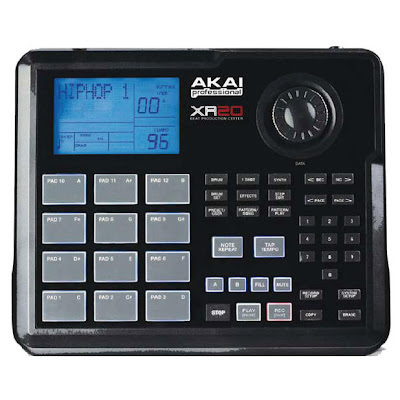 AKAI XR20 beat production machine...for sale! The AKAI XR20 BEAT PRODUCTION center. Superb controller, the power of MPC creativity for your own sequencer. The DR-202 Dr. Groove takes BOSS’ popular programmable drum machine concept into the Groove Zone. 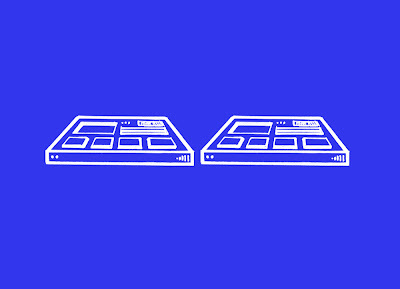 This block-rockin’ beat machine features 256 drum and bass sounds exclusively developed for groove music production—from hip-hop to jungle, drum ‘n’ bass, trip hop, house, Latin and more. BID ON THIS ITEM HERE!